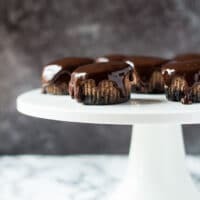 Mini Chocolate Orange Cheesecakes – Mini chocolate cheesecakes infused with orange and topped with a dark chocolate orange ganache! Here is another mini cheesecake recipe for you! The last ones I made were these scrumptious Chocolate Easter Cheesecakes decorated with Mini Eggs. I used the same base cheesecake recipe to make this chocolate orange version, and topped them with a deliciously creamy dark chocolate orange ganache. Perfection. I just love the chocolate and orange combination! The dark chocolate orange ganache is incredibly creamy, rich, and full of flavour. 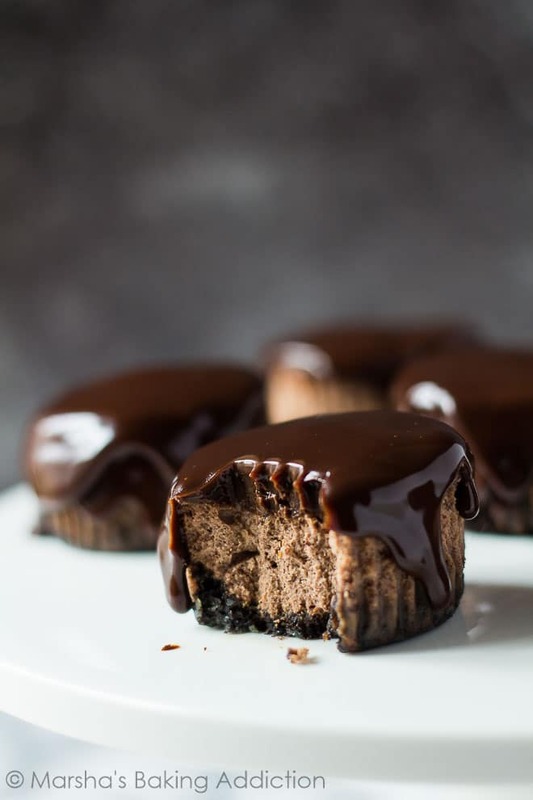 It’s the perfect topping for these mini chocolate orange cheesecakes! Dark chocolate: You can use milk, or semi-sweet. To make these cheesecakes, simply use food processor to pulse the Oreos into fine crumbs. Add the melted butter, and mix until all the crumbs are moist. Press the mixture into a muffin pan lined with muffin cases. Bake for 8 minutes, then allow to cool whilst preparing the cheesecake mixture. Beat the cream cheese and sugar together until combined. Beat in the eggs, one at a time, then mix in the cocoa powder, zest and orange juice. Divide the mixture between the muffin cases, and bake for 20 – 22 minutes, or until the cheesecakes are just set. Allow to cool completely in the pan on a wire rack, then refrigerate for at least 4 hours, or overnight. 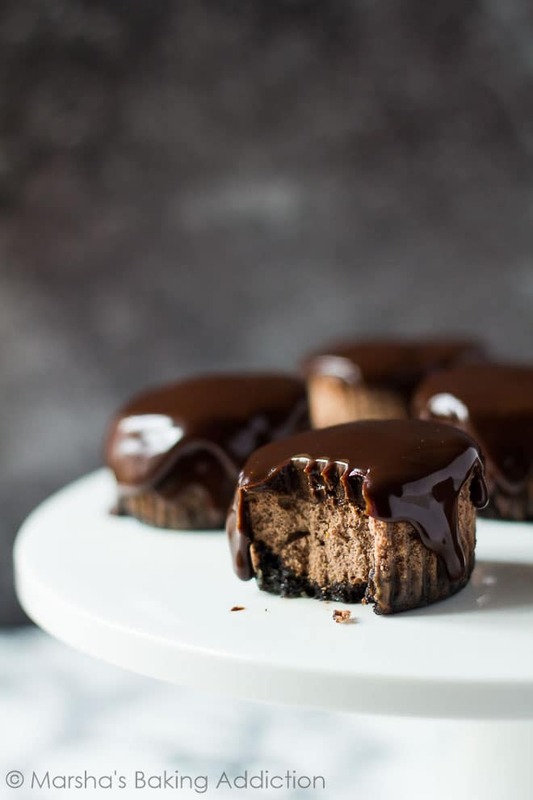 For the ganache, place the chocolate and cream into a large microwave-safe bowl, and heat in 30 second intervals, stirring after each one, until melted and smooth. Whisk in the orange juice and allow to cool for 5 minutes. Pour the ganache over the tops of the cheesecakes, and refrigerate until set. How long will these cheesecakes last? These cheesecakes can be covered and stored in the fridge for up to 4 days. 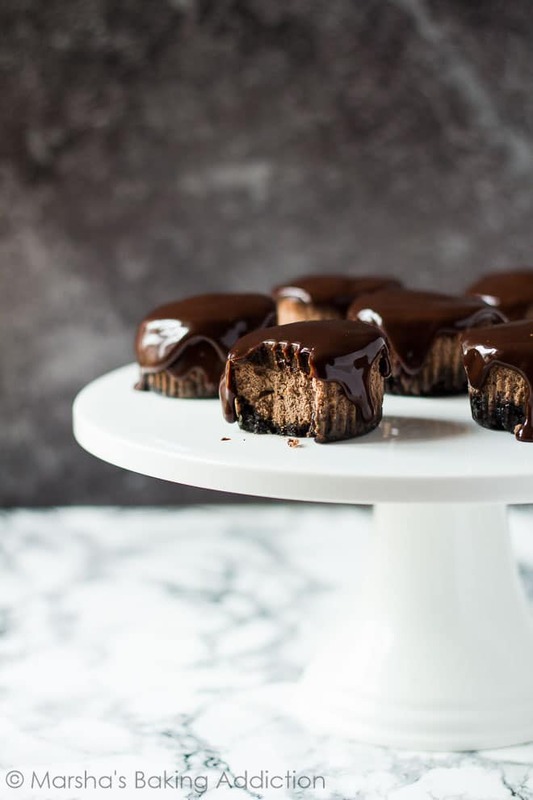 Can I freeze these mini cheesecakes? Yes. They freeze well, covered tightly, for up to 2 months. Thaw overnight in the fridge before glazing and serving. 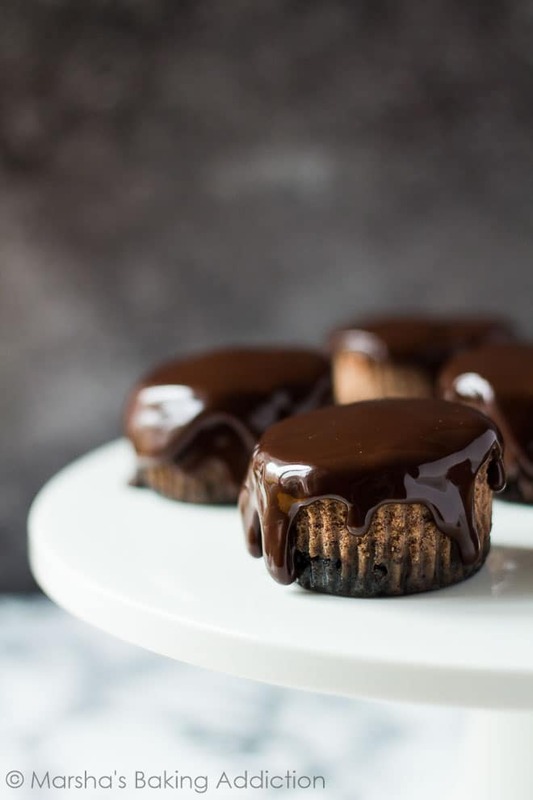 Mini chocolate cheesecakes infused with orange and topped with a dark chocolate orange ganache! Using a food processor, pulse the Oreos into fine crumbs. Add the melted butter, and mix until all the crumbs are moist. Press the mixture into the prepared muffin cases. Bake for 8 minutes, then allow to cool whilst preparing the cheesecake. Using a handheld or stand mixer fitted with the paddle attachment, beat the cream cheese and sugar until combined. Beat in the eggs, one at a time, then mix in the cocoa powder, zest and orange juice. Divide the mixture between the prepared muffin cases, and bake for 20 - 22 minutes, or until the cheesecakes are just set. Allow to cool completely in the pan on a wire rack, then refrigerate for at least 4 hours, or overnight. 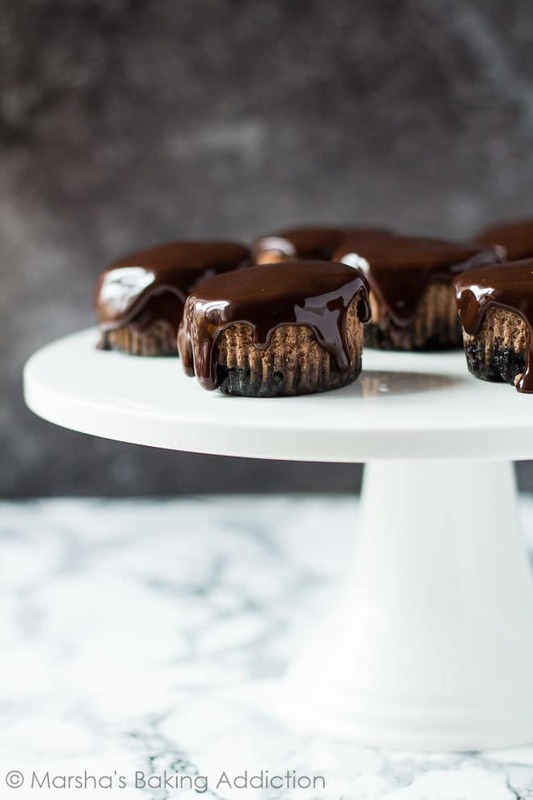 For the ganache, place the chocolate and cream into a large microwave-safe bowl, and heat in 30 second intervals, stirring after each one, until melted and smooth. Whisk in the orange juice and allow to cool for 5 minutes. Pour the ganache over the tops of the cheesecakes, and chill until set. These cheesecakes freeze well, covered tightly, for up to 2 months. Thaw overnight in the fridge before glazing and serving. Thank you Marsha for the recipe . I’m so glad they were a hit! Thanks, Lina! They look lovely and must be delicious too! Oh yum! I love these cute little mini cheesecakes. They sound and look amazing! I love the addition of orange juice! The hardest part about cheesecake is always waiting for it to chill! I find for a full size cheesecake it really is best to let it sit overnight and really firm up. But, even with this struggle, cheesecake is totally worth it. Yummy! These cheesecakes are so adorable! Love the chocoalte and orange combo! Sorry to hear you haven’t been well this week, hope you feel better soon! Thank you so much, Demeter! 🙂 I’m feeling much better now ^_^ You have a great weekend, too! Sorry to hear that you are under the weather Marsha. I hope you are on the mend (or even better. . .fully recovered). Ooops! Not sure how that got submitted before I was finished with my reply (crazy laptop). I wanted to tell you how scrumptious (and cute) these cheesecakes look. I adore the Oreo crust and bet that orange ganache is a lovely complement to the chocolatey cheesecake. Mini anything is simply the best! Love these Mini cheescakes, Marsha! Orange and chocolate is so good together! And that ganache looks totally on point! Cheers girlie! Everywhere I go lately I’m being haunted by cheesecake. How can I resist these? 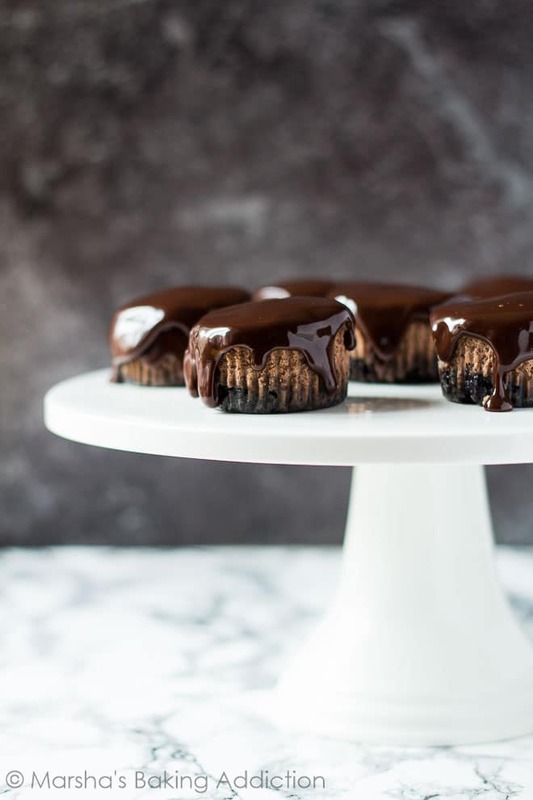 The chocolate orange ganache sounds amazing! These are gorgeous!